With long distance ranging capability and angle compensated readings, the Leica Rangemaster CRF 1600-R rangefinder offers fans of the Leica 1600-B a no frills but more affordable option. But does this more basic Leica 1600-R rangefinder still bring enough to the table to appeal to hunters and long range shooters? The Leica 1600-R is a 7x magnification rangefinder that can read highly reflective targets out to a maximum range of 1600 yards. This rangefinder is equipped with a both an angle compensation and a scan mode. The display is a red LED that automatically adjusts intensity to match the lighting conditions. Next, this unit can measure in either yards or meters and features an adjustable diopter. Finally, the Leica CRF 1600-R is powered by a single CR2 battery, comes with a carrying case and is waterproof. The housing on the Leica 1600-R and other Leica rangefinders is unique in that is made up of a plastic material that has been reinforced with carbon fiber. Two buttons mounted on the top of the unit are used to program and operate the unit; the large button that sticks up is the power button and the more low profile button directly in front of it is the mode button. The eyepiece cup is the type that can be folded down for use with glasses; and the eyepiece also doubles as the diopter adjustment which the user can rotate to the left or right until the display is focused to their eyes. The Leica 1600-R has 7x magnification which is generally the maximum power found on this style of vertical rangefinder as holding these compact lightweight rangefinders steady can become difficult at high magnifications. However, 7x magnification provides more precision especially at longer ranges and is generally the preferred power for this type of extreme range compact rangefinder. The display on this unit is a red LED type and its intensity is automatically adjusted according to the amount of available light. The read out is very simple with the rounded square reticle in the middle and range data reported directly below it. Not a lot of icons or mode indicators, and the readout will flash when the battery is getting low letting the user know the unit has about 100 ranges left before the battery dies. Not much to the setup of this unit, the user select US mode to get readings in yards or EU mode to get readings in meters. The only other choice is to turn on EHR, equivalent horizontal range, which provides true horizontal distances out to 1200 yards, it can still display line of sight distances past there out to the maximum distance you can get the rangefinder to read. Once set up, one press of the power button wakes up the unit and shows the reticle and the next press ranges a target. Also, once the display is active, pressing and holding the power button down puts the unit in scan mode which allows the user to move from target to target or follow a moving target while the display continuously updates ranges at an average of about once a second. Probably the most notable positive for the Leica 1600-R is its ability to provide true horizontal ranges from 10 - 1200 yards as opposed to the 100 - 875 yards of the Leica 1600-B, which makes this new model more suitable for bowhunting. Also, we were glad to see this unit rated as waterproof, or watertight as Leica calls it, up to one meter; which provides a little more insurance that unit could handle an unexpected drop or fall into water. Next, the 7x magnification and ranging capability of this unit put it near the top of its class for long distance performance in this style of rangefinder. Finally, the display is very clutter free and we like that the unit’s reading flashes when the battery is low instead of a having large battery icon taking up screen space to tell us that the unit has a full battery like on most other rangefinders. This unit does not come with a last target priority setting which is useful when hunting to keep the rangefinder from picking up unintended obstacles like branches or brush that are between the shooter and target. Next, while this unit is a couple hundred dollars cheaper than the Leica 1600-B, it is still about $100 more than competing models in this class like the Sig Kilo 2000. Finally, we would have liked to seen this unit include the ability to display the angle of the shot which would appeal to long range shooters who like to have the angle of the shot in degrees to enter into their ballistic calculators. For those of you familiar with the Leica rangefinders, the Leica CRF 1600-R is replacing the Leica CRF 1000-R model and is probably best thought of as an upgraded version of that model. The Leica 1600-R provides line of sight distance out to 1600 yards or more depending on how far you can get it to read, and angle compensated distance readings out to 1200 yards; so if this meets your criteria, you get significant saving over the Leica 1600-B. However, if you want a device that will calculate the angle to the target in degrees, temperature, and pressure readings; or calculate holdover and click adjustment then you need to step up to the Leica CRF 1600-B model. 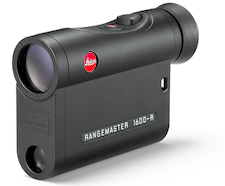 Many hunters have two simple criteria for a rangefinder: 1) long distance ranging capability and 2) angle compensated distances; and the Leica Rangemaster CRF 1600-R does both of these. Also, the ability of this unit to give these angle compensated readings as close as 10 yards opens up the door for archery hunting with this unit. In short the Leica 1600-R is well suited for hunting use if all you need is angle compensated readings; this model was introduced in July of 2016 and currently sells for around $599 online. 4.5" x 1.3" x 3"